The word “bong” refers to a tall pipe that filters the smoke through water; it’s as simple as that. But a long time ago—at least, it was a long time ago here in Colorado—the word “bong” was taboo. If you went into a headshop and asked for a bong, you’d get kicked out because the term “bong” was associated with marijuana which used to be illegal, so you had to ask for a “water pipe” instead. Yeah, it’s stupid, but marijuana paraphernalia used to be just as illegal as marijuana, so the headshops had to follow the rules and be militant about not selling “bongs,” even though they were. In this case, the two terms were spawned by what was legal and what wasn’t, but all you really need to know is that the term “bong” and “water pipe” refer to the same thing (and now, you can say “bong” all day long in headshops and they’re cool with it). But as a disclaimer, if the bong is really small, or if it’s the shape of a pipe, it’s called a “bubbler” because of the noise the smoke makes as it goes through the water. As to the bong itself, the glass tube through which the smoke travels down into the water is called the “stem,” and some stems have lots of holes in them to diffuse the smoke in the water—in this instance, the stem is called a “diffuser.” But if the bong is super fancy, it’ll have a “percolator,” which is a separate chamber that diffuses the smoke a second time through a “tree,” which is just a bunch of smaller diffusers. And a lot of bongs will have an “ice catch,” which is nothing more than a depression in the bong tube that’s designed to hold ice cubes to cool your hits (I’m a big fan of these). Lastly, if the bowl of the bong is on top, and there are multiple mouthpieces that allow more than one person to smoke at once, you’re smoking a “hookah,” not a bong. If the pipe has a large carb (the hole you cover with your finger) on the end instead of the side, it’s called a “steamroller” because when you take your finger off the hole, the direct path of air hits you like a steamroller. Or, if you load your flower into the front of the pipe instead of the top, the pipe is called a “chillum,” which is a term that dates back to when people would use “chillers” to hold their cigarettes just like Cruella de Vil did when she wasn’t busy trying to catch dalmatian puppies. Or, if the pipe is really small, it’s called a “sneak-a-toke” for obvious reasons. But if the pipe is small and you load a small amount into the front of it, it’s called a “bat.” Some bats are made from glass, but they’re usually metal and painted to look like a cigarette for discretion. And to take things a step further, a bat fits into a “dugout,” which is a wooden block that has been dug out to make room for a bat and a small amount of flower (we sell these in our Durango dispensary, so if you need a visual, come see us). The most self-expletory piece of paraphernalia is a “grinder,” which is a small box you use to grind flower. If you grind your pot and roll it into a joint and then smoke it until not much is left, this is called a “roach” because the burnt end looks like a roach. And as you’d imagine, it’s difficult to hold the roach because it’s so small, so most people use a hemostat to hold it. But since we’re stoners, we don’t use words like “hemostat”: we prefer “alligator clip” or “roach clip.” I know I just used a couple terms like “joint” that don’t pertain to paraphernalia, but don’t worry, if you’re fuzzy on marijuana-related words, I wrote an entire piece on the subject that you can read HERE. As I’m sure you know, new-school cannabis concentrates, or “dabs,” are becoming quite popular, and with them comes a whole new litany of slang terms, so I’ll get into that, too. The simplest device is a “vape pen,” but these are also called “dab pens” or “hash pens.” Vape pens are comprised of two components: the “battery” and the “vape cartridge,” or the “cart” for short, but we also sell all-in-one “disposable vape pens” that are super simple to use. The next step up would be a “dab rig,” which is a specially-designed pipe you use to dab concentrates. Besides the rig, you’ll also need a “torch” and a “dabber.” You use the butane torch to heat the “nail,” and you use the dabber (which is sometimes called a “dab tool”) to apply the concentrate to the nail—nails can be made from titanium, quartz, glass, or porcelain. But if the dab rig has a bowl you heat instead of a nail, the bowl is called the “banger.” Granted, if this is something you’re interested in trying, I’d recommend coming into our shop for a demonstration because it’d be easier to show you how it works than to explain it, but I’m going to soldier on. Some rigs have a glass “dome” that goes over the nail, but if the rig has a banger instead of a nail, it usually has a “carb cap” as well, which is something you put on top of the bowl after putting in the concentrate so smoke doesn’t escape. The last thing you need to know per rigs is that some of them are pretty high-tech; they have an “e-nail” which is an electronically-heated nail that doesn’t require a torch. We’re done! I hope this cleared things up for you if you’re a novice, and if you’re a regular smoker, I’d love to know how many points you got. But if you’re still fuzzy on any of these terms, you’re more than welcome to come see us at 208 Parker Avenue or give us a shout at (970) 403-3710; we’ll answer all your questions. 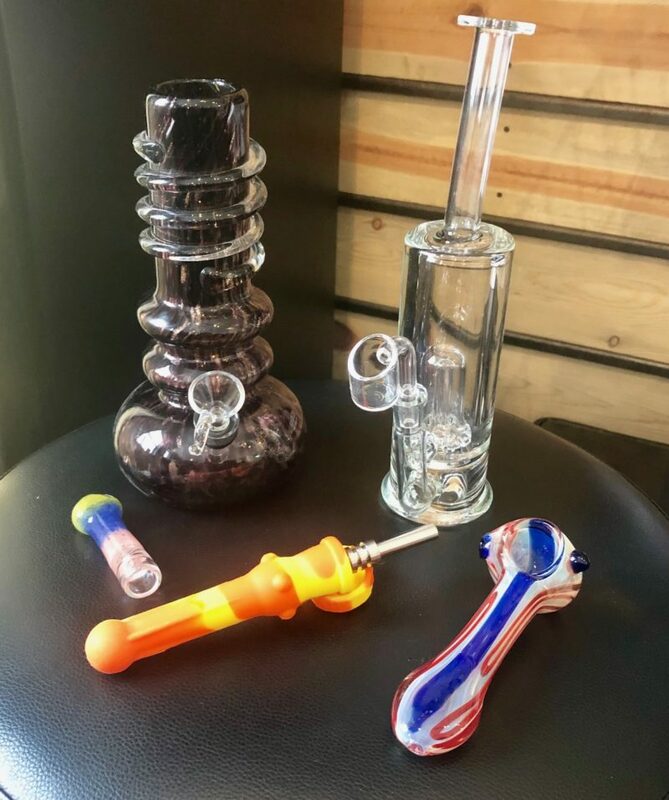 And of course, we sell quite a few of the aforementioned pieces of paraphernalia at a low price right here in our Durango dispensary, because We’re Your Best Buds!